Těšín Beskydy are characterized by a large number of chalets on their summits. To count them all fingers and toes on human limbs would not be enough! Count with us: Ropička, Prašivá, Javorový, Kozinec, Ostrý, Slavíč, Kamenitý, Kozubová, Severka, Skalka, Kamnenná chata, Gírová, Studeničné, Polanka, Bahenec, Stožek (PL), Soszow(PL), Čantoryje, Filipka, Loučka, Hrádek. Total of - 21 chalets! This is certainly a sufficient guarantee that visiting Těšín Beskydy is more than interesting. We have prepared some tips for hikes which are not time demanding, ideal for families with children, occasional tourist or are suitable alternatives for a "little afternoon trip". Of course, it is necessary to count with hiking uphill, but the distance is not more than 2-3 kilometres which can be handled in 45 minutes. By car we can get to the chalet Hradek, if in the center of the village Hrádek we turn from the main road across the railway crossing - directions will help us. We leave the car by the chalet in the car park and then we walk towards Filipka along the green marked path. Tip: approximately 500 m behind the chalet is meeting point of three villages) on Filipka. where we find green sing. About 200 m after turning into the woods you find a good place to park the car. Path leads uphill through the woods and bring us to the summit of Filipka. There is a meeting point of three villages Trojmezí and a chalet, our goal. Physically demanding. Go by car along the road leading from the Mosty u Jablunkova to Hrčava find a green marked path going to the left. Leave the car at this point and set off to Gírova. The path goes along the houses initially and it is gradually coming into the forest and soaring up the hill to link a red marked path at the end, which leads us to the chalet if we head to the left. A forest road leads from the above mentioned "hrčavska" route to Studeničné before advised tourist sign (also the cycling path no. 561). 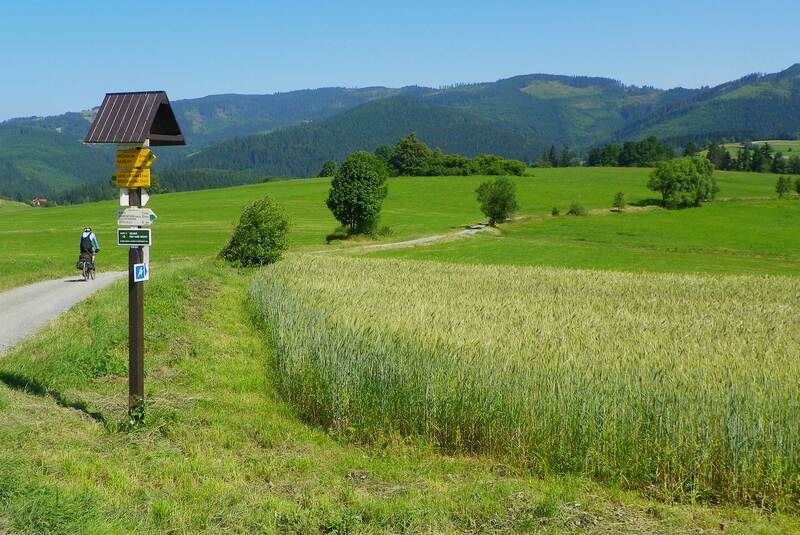 If there is not currently placed a no entry sign, we may use it to get to Studeničné chalet, where we leave the car and we go quite comfortably to Gírova. Compared with the first option it is a very relaxing walk. It is possible to get by car up to the chalet Polanka from the village of Písek - the entry is allowed for the chalet guests. Respect this "advantage" and certainly stop at the cottage and enjoy some refreshments! Then go to Gírova - there are two options. Either return to the last corner about 50 meters from Polanka and follow an unmarked forest road half a kilometer. You will slowly climb up to the green sign. Or go from the cottage over the meadow and up the hill and find the green sign. In both cases, when you encounter a sign, go left until you get to the chalet Gírová. It is a relaxed option with nice views. There is a bigger car park. There is a tourist disambiguation located near the stop, where a blue marked path to Kamenité begins. We go first 100 meters along the road, then we follow a footpath into the woods and we ascend along a forest path. This takes us to the meadow in the upper right corner we see our goal - chalet Kamenité. which if necessary is able to transport you and your bike. About 200 meters long green marked path leads us to a slight slope, after which we go up to the chalet, which we can see all the time. From the chalet there are beautiful views of the landscape and it is a starting point for paragliding.